POP Series cards were rewards from Pokemon Organized Play. As a reward for playing in Pokemon Leagues, players were occasionally given 2 card booster packs. Each Series went with a different season of the Pokemon League. Umbreon Gold Star is an extremely rare pull from Pop Series 5. There are 40 PSA 10 Gold Star Umbreons in circulation. 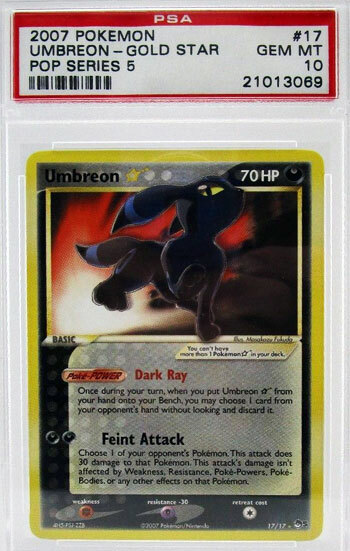 In November 2017, this copy of Umbreon sold for $10,200 and received 26 bids! Wow! Does that feel over-priced to anyone else? In the last 3 months there have been 3 other PSA 10’s sold. Those sales ranged in final prices of $1400 to $1900. Some quick notes on our rankings: These are all cards you could have reasonably collected. These are all cards that were available in the United States. These are cards that appeared in Booster Boxes, Booster packs, Leagues, and/or Starter Sets. Pokémon TCG fans/players could have plausibly obtained these cards through auctions, trades and/or blind luck pulls. There are no cards in our list that were given out as prizes for winning contests. All values are based on actual sales of Pokemon Cards on eBay during the 4th quarter of 2017. Our Prices are based on Professionally-Graded, Gem Mint cards, which are independently certified on their condition. Here’s an article on Graded Pokemon Cards if you don’t know what Graded Cards are.